There's a right way and a wrong way to do anything, even cleaning vinyl windows. Here are a few non-obvious tips that could help make your window cleaning easier, more efficient and safer. Whether you prefer spring or fall to wash and clean your windows this is a perfect time to inspect for problems that may lead to further issues down the read. Before you start to clean, check all windows for loose or vacant calking and look for visible cracks or streaking inside the window pane. If you have any issues consider repairing them sooner than later. If you had your windows installed by Bayview Windows, give us a call. Before you clean the glass, gently hose down the entire frame and window, then wash it with mild soap & water, vinegar or baby shampoo, starting at the top and working your way down with a clean soft cloth, sponge or soft-bristle brush, and finally rinse. To clean the glass try one-part white vinegar to 2 parts water in a spray bottle, or if you prefer the soapier smell, a commercial class cleaning product made specifically for glass. Soft paper towels work great, but some people will prefer a rubber-bladed squeegee. What about the old newspaper trick? Windows tend to accumulate a lot of what is going on in the environment, exterior dust particles that collect on water droplets, bug and spider refuge and guts, soggy wet leaves footprints, mineral deposits, bird droppings… all of which get baked by the sun. Often cleansers just don’t sit on the glass surface long enough to soften these deposits. If you are a perfectionist, try the newspaper and vinegar trick, the ink provides a very subtle non-abrasive grit that gets ride of fine contaminants and oils without harming the glass. Don’t use cleaners that contain solvents such as grease remover, chlorine bleach, strong soaps and detergents containing organic solvents, these may damage surfaces and cause yellowing. 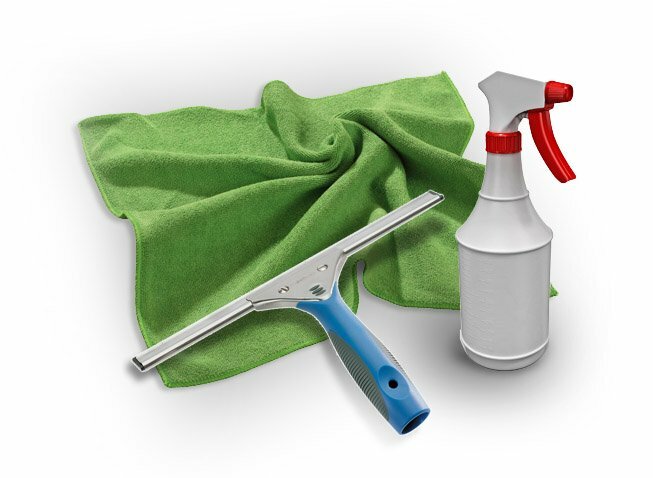 Don’t use cleaners containing abrasive materials, these can damage glass and vinyl surfaces. Avoid cleaning in direct sunlight or in temperatures too hot or too cold, heat will dry cleanser too quickly, cold will dry too slow and leave streaks. Twenty years ago razor blades would have been an ideal tool for removing baked on window surface contaminants. But today’s windows are very different, the glass may be coated with hard chemicals and tints, that although very durable for regular cleaning, can be damaged or scratched by metal materials. Resist the temptation to use a power washer! Although power washers make outside cleaning life easier, power washers love to eat windows. Power washers are far too aggressive cleaning tools, especially at close range. They can damage window frame surfaces, penetrate calking seals and open up areas for leaks and insect invasion. Professional Window Installation, does it matter?